A few years ago Rainer Keuchel ported version 3.7 of the popular open source plotting tool, Gnuplot, to devices running WinCE. I discovered it back when I was running Windows Mobile 2003SE on my Dell Axim X50v and it worked very nicely. Recently I thought I would test it on my new Windows Mobile 6 device but before I got around to doing this I discovered that André Stemper had recently ported version 4.2 to Windows Mobile. Gnuplot has come a long way since version 3.7 and so I was quite excited about this new port. Although there is no .cab file, the installation procedure is straightforward, simply download the zip file and extract it to the desired location on your device. To run it you just find the .exe file in the file explorer and double click on it. If you want Gnuplot to appear in start->Programs then you will need to manually create a shortcut which I have been told is not difficult but I have so far not done it myself. I like the fact that you can install directly on your device without the need for Activesync and a PC but a .cab file that takes care of the shortcut for you would have been even better. Gnuplot is a console-based application but you will not need to install a 3rd party console application such as pocket console in order to use it since this port includes it’s own console built in. When you run the program you will see a screen similar to the one below. 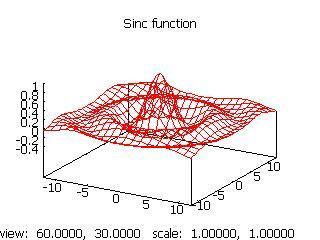 results in the following graph – pretty much identical to the desktop version. The above plot looks odd, not because there is anything wrong with this port, but because gnuplot does not plot the tan function very well by default – those pesky singularities you see. 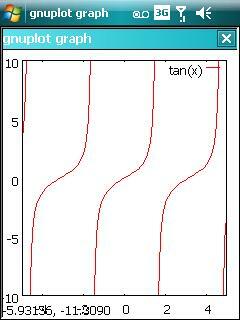 Manually setting the x and y axes results in something much better. Obviously things are a little more cramped on a 240×320 QVGA device as compared to your desktop but it is perfectly use-able. This port also supports full VGA devices (in fact it was developed on one) so if you are lucky enough to have one of these you will get even more mileage from the application. One way of getting a little more screen real estate is to set gnuplot to ‘fit window’ mode which gets rid of the second window title bar – you can also set it to full screen mode while removes all surrounding title bars. but this is not supported in the pocket version since the number of available terminals is limited. One minor gripe that I have is that I cannot seem to find a way to output a graph to an image file that is natively supported by Windows Mobile so I cannot produce a plot in gnuplot and then open it in the standard image viewer. Of course one way around this is to use some sort of screenshot-taking program as I did for all of the images in this post. If you would like to write Gnuplot scripts directly on your hand held rather than transferring them from a desktop machine then I highly recommend using the freeware pocket notepad application. 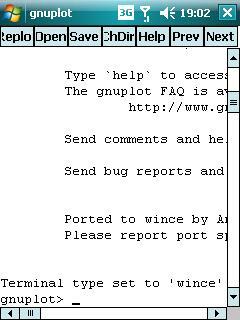 The built in text editor of Total Commander will also do the job nicely but please do not use a word processing package such as Pocket Word as the resulting file will contain all manner of formatting rubbish that will confuse Gnuplot and result in a stream of errors. On the desktop version of Gnuplot you can click on a 3D plot with your mouse and rotate it in real time which can be very useful for looking at various features of your function or data. 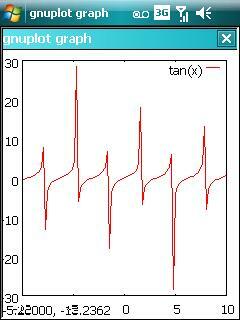 This is supported in this port but it does not work as well since it takes a while to replot the graph at each angle. This means that you can still view the plot from any angle you choose using the stylus but you cannot move it around in real time which is a shame as it would have looked very cool as well as being rather useful. I guess this is due to the reduced processing power available on pocket devices. Another minor problem with this port is that the help files are not included which can be annoying when you are on the train and cannot remember the exact syntax for some rarely used feature. These really are just minor issues though – almost everything from the Desktop version is here – take a look at these full screen 3d plots taken straight from my Tytn II in landscape mode for example. 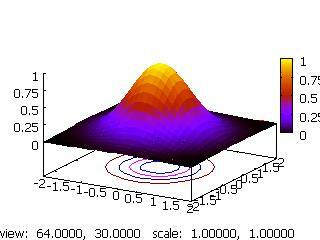 I could go on to discuss many more features such as the ability to evaluate and plot special functions (eg. Bessel functions, the Gamma function or the lambertw function), contour plots, histograms, scatter plots etc etc but then this would end up being a review of Gnuplot itself rather than a review of this port. Gnuplot is a very powerful and feature-rich piece of software and this pocket version brings almost all of that functionality to Windows Mobile powered PDAs and I highly recommend it. If you have never used Gnuplot before and would like an idea of what it can do then I suggest taking a look at the Gnuplot homepage or the very informative Gnuplot-tips page.